WAS THE WAR DESIGNED to stave off cuts from the Navy? On 7th April 1982 the Opposition spokesman complained, ‘We have a right to know the expedition’s objectives and we have not been told.’ Was a war the aim? Pym, Britain’s new Foreign Secretary, did not see it that way, nor did Al Haig the American Secretary of State: at every stage the British operation depended upon US assistance, and America really did not want a war between two of its allies. It hoped for – and still does want today – a negotiated settlement. Elected members of the Prime Minster’s Cabinet were not consulted, over the five weeks from 2nd April to 5th May. Admiral Lewin Chief of Defence Staff arrived at Chequers shortly before lunch, and ‘in what is admitted by all politicians present at the time to have been a meeting that lasted no more than 15 minutes on the doorstep of Chequers, he obtained authority from the war Cabinet to attack all Argentine warships anywhere on the high seas. 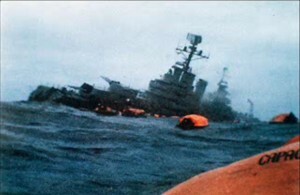 Now this is absolutely crucial it seems to me when we are talking about political control of the military… Ministers have said since that they didn’t know which way the Belgrano was sailing. Maybe they should have asked. What sort of decision were they really taking, not even knowing where the ship was, which way it was going and what the threat to the task force was? CP55. The ‘War cabinet’ here renounces its control over the war, without consulting its subcommittee of Mandarins, by telling the military that they could sink anything – allegedly doing so in ignorance (a) that the Argentine fleet had been sailing home-wards since dawn, and (b) that plans for an acceptable peace proposal had been hammered out that weekend in Peru, concordant with the mission of Francis Pym in New York and Washington. We are further asked to believe that none of the radio communication of the Argentine fleet had been received at GCHQ in Cheltenham. Whereas, as Paul Rogers told the Foreign Affairs Committee, ‘abundant circumstantial evidence now exists, from London, Washington and Lima,’ (FAC 139) that the War Cabinet was well aware of the diplomatic developments prior to the sinking; he further suggested that Thatcher was up at Naval Headquarters at Northwoods that afternoon’ (FAC p.138, Times 24 Sept 1984). How on earth can a war that Britain did not start be said to have been “designed to” do anything by the Royal Navy? Specious nonsense.